Maha Lakshmi offers the limitless abundance and prosperity always available for each of us. Adorned with gold ornaments and seated atop a lotus flower, Maha Lakshmi represents perfection and the majestic beauty of life. In the energy of Maha Lakshmi, we lack no-thing, for the entire world is our own creation. Japa: Practice ten minutes of japa using the mantra Om Shrim Maha Lakshmiyei Namaha. Silent Meditation: Sit in silence for fifteen minutes to immerse yourself in the vibration of Maha Lakshmi. Listen to the 20 minute guided meditation recorded by Sai Maa’s Brahmacharini, Lalita Shree Dasi, for the second phase of Navaratri. Goddess Lakshmi is always with Vishnu, accompanying him in his seva of sustaining the universe. She is everything and represents everything, absolutely everything one can ever imagine needing on this plane. If you wish a good life in all domains, worship Maha Lakshmi. You’ll get prosperity, beauty, and abundance, both material and spiritual. Harmony is her seva to mankind. So, Lakshmi is very loved, worshiped, and she pours the grace of devotion. 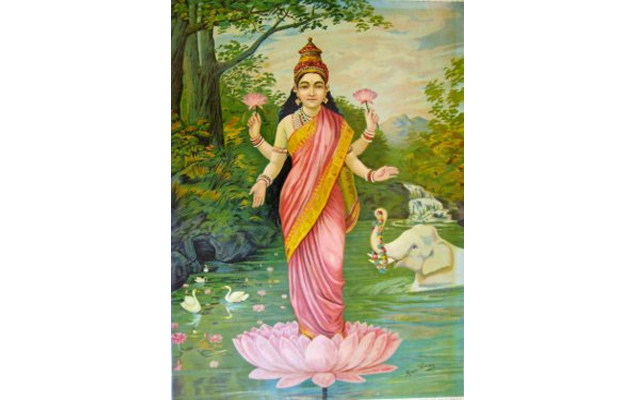 Maha Lakshmi is radiant, standing on a delicate lotus—the symbol of purity. She has four arms: one hand carries a flower—the symbol of spiritual flourishment, purity of heart, and beauty; another hand holds a book—the symbol of knowledge, wisdom, and fearlessness; in another hand are thousands of gold coins continuously offered to the world; and in the fourth hand is a golden disc to transmute all darkness (the disc symbolizes the power of victory and devotion). When one worships Maha Lakshmi, she offers us all her attributes: wealth in all forms, health, material success, Grace, Divine Beauty, Divine Love, a prosperous life, freedom, liberation—moksha. This is Maha Lakshmi’s Grace. As soon as we honor the abundance of Maha Lakshmi, we attract the Shakti. Is my glass half empty or half full? Do I spend most of my time thinking about what I don’t have, what I lack, what is missing, or do I appreciate all that I am, what is present in my life, all the opportunities available that I can realize? Do I limit my perspective about abundance to the material, to finances, to what I have? What is my context for abundance (habitual patterns of thinking), from which I make choices and take action? Will I make new choices now, concerning abundance in my life – what it is, its different forms, which are most important for me at this time? What actions will I take within myself and with others to manifest these most important forms of abundance in my life?